Home > Blog > Towel Care > How Do I Keep Towels Soft? How Do I Keep Towels Soft? It’s a hard life, being a towel. All that hard water and friction can really wear a fabric down. Not to mention regular exposure to oil and soil. Even our fluffy, luxurious Turkish towels need a little TLC now and then, to keep them feeling their best. If you’ve ever asked the question ‘How do I keep towels soft?’ we can help. We’ve put together some tips to get your towels as good as new. Cut back on detergent. Towels feel stiff because they start to build up soapy residue. By using a little less detergent than suggested, your machine’s rinse cycle will have an easier time washing out those last pesky bits of soap. Wash in warm water. Warmer water (around body temperature is best) absorbs detergent better, leaving less buildup on your towels. You can also let detergent dissolve in the washer before adding towels – just start the wash cycle, add soap and wait a minute or two before adding your towels. Replace fabric softeners with vinegar. Fabric softeners contain silicon that will make towels water repellent, so they won’t get as good a wash. Instead, soften your towels by using one cup of white vinegar about every six weeks; this will remove the soapy residue that makes towels feel rough, bringing back softness while restoring them to full absorbency. Simply run the towels through a regular washing cycle, then redo them using vinegar instead of soap. Use baking soda. This will help loosen up fibers and clean off any chemicals or grime, making your towels softer. Just mix half a cup of baking soda with your normal amount of detergent. As an added bonus, baking soda naturally eliminates musty odors that may have built up – say, if you left damp towels lying around in a gym bag or in a pile on the bathroom floor. Lighten your load. Don’t put too many towels in your washer at once. Not only will it strain the machine, it won’t allow enough room to rinse out all the dirt and detergent from your towels. The same goes for your dryer; if you overload it, there won’t be enough air in the dryer to properly fluff the fabric. So you’ll get stiff, matted towels, instead of soft, fluffy ones. For most standard machines, try two or three bath towels at a time, along with hand towels and washcloths. Toss in a tennis ball or dryer ball. Having a few unused tennis balls or dryer balls bouncing around in the dryer helps remove lumps while softening and fluffing your towels. Go easy on the tumble drying. True, it makes towels fluffier, but heat from the dryer can damage the integrity of the Turkish cotton. So use a lower setting, or alternate between air drying and tumble drying. You can also partially dry towels on the line and then finish them up in the dryer. If you prefer line drying, shake the towels out afterwards to fluff up the fibers, or toss them in the dryer on a cool setting for additional softness. There you have it – the answer to the age-old question ‘How do I keep towels soft?’ Follow these self-help tips and your towels will stay plush and fluffy their whole lives. For more advice, visit our towel care section. What is your most thick- fluffy luxuries towel? Thanks for you inquiry. 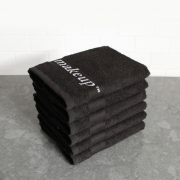 Our most luxurious towel, would be Mini-Squares. I have tried less soap powder and using vinegar instead of conditioner but they are still hard I would appreciate some advice,thank you. i, like your obove clients have uded vinega , white distilled, every which way. towels still scratchy, something wrong, advise correct procedure. Does spin speed affect the softness of towels? Thanks. I will try these suggestions. What could be used, if not using fabric softener, to give towels a fresh, fragrant smell. I wouldn’t want to smell vinegar in my towel. I use unstoppables scent in my towel and sheet wash.
Why u sold not add Fabric Softener when washing towels? It coats the towels so they become less absorbent. Except the vinegar smell evaporates once it dries so there’s really nothing to worry about. @Eric — Some washing machines have a pause function, where you can pause the wash cycle within 5 minutes to add or remove clothing. I use unstoppables to give my towels and sheets scent. Sorry that was the wrong thread. I have a samsung addwash door on my machine. It’s amazing. Try one at a time. This should help keep your towels soft. I red that to get my towels soft again .. Use vinegar and baking soda but I need to know about how much to use could you please send me amounts? Add 1/2 cup of baking soda to the laundry when you add your regular liquid detergent. Baking soda helps whiten whites, brighten brights, and ensure odor-free clothing. If you would prefer to use vinegar, use the same amount — 1/2 cup per load. I’ve just inherited an newish front loader when my long term top loader finally died. Towels that used to be quite soft from the top loader are now really hard from the front loader. Vinegar doesn’t make any difference. Any ideas? Hi Chris, I’m sad to report that this seems to be a common problem with front loading washing machines. If anyone has one that doesn’t harden towels I’d be interested to know the brand. I use vinegar in my rinse water all of the time adding a few drops of lavender oil. If you use vinager would that make the towel smell bad? How to make it smell fresh and clean when using vinager?